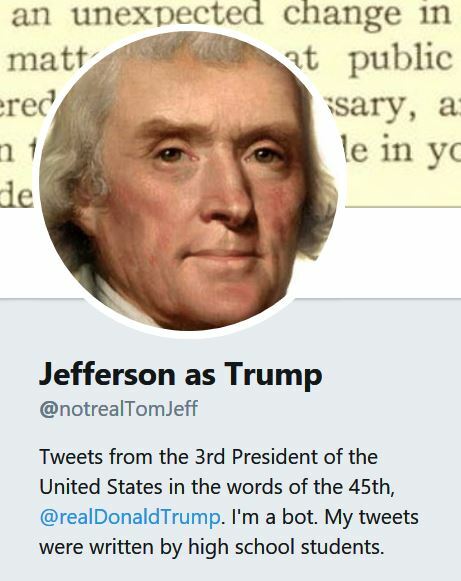 I got the blowback I anticipated when I shared my students’ most recent digital history project, “If Jefferson had Used Twitter, and if Jefferson were Trump.” More than one teacher said the project, in which students text mined Jefferson’s papers and Trump’s tweets in order to tweet as @notrealTomJeff, was politically biased and inappropriate for the classroom. What I didn’t anticipate was a strong defense of the project. “It’s a bit harsh to criticize an exercise in examining what a historical figure might sound like in a modern President’s favorite media,” remarked one teacher, while others clicked thumbs-up and asked about analyzing word frequencies so they could do something similar in their classes. I was happy to get these questions. Thank you, Hamilton, for setting up a corrupt and failing economic system—a true loser. We’re tired of the Barbary Coast pirates taking our cargo. We’re going to build more gunboats and make the pirates pay for them! We won with the rich farmer. We won with the poor farmer. I love the poor farmer!